An increased entry of 500 store cattle at Markethill on Saturday, January 12th sold in a noticeably stronger trade in all rings with buyers and sellers from throughout Northern Ireland in attendance. The 200 heifers returned a much stronger trade for all types. Good quality heavy heifers sold from £200 to £227 per 100 kilos for 522k Limousin at £1,185 from an Armagh producer followed by £221 per 100 kilos for 604k Charolais at £1,335 from a Belleeks farmer. Good quality middleweight heifers sold steadily from £200 to £229 per 100 kilos for 440k Limousin at £1,015 from a Tullyvallen producer followed by £226 for 494k Limousin at £1,115 from a Carryduff producer. Lightweight heifers to £232 per 100 kilos for 330k Limousin at £765 from a Newtownhamilton farmer. Armagh farmer 522k, £1,185, £227.00; Belleeks farmer 604k, £1,335, £221.00; Armagh farmer 526k, £1,155, £220.00; Tullyvallen farmer 504k, £1,105, £219.00; Carryduff farmer 524k, £1,145, £219.00; Armagh farmer 520k, £1,135, £218.00; Armagh farmer 548k, £1,195, £218.00; Armagh farmer 546k, £1,185, £217.00; Carryduff farmer 514k, £1,115, £217.00 and Tandragee farmer 502k, £1,075, £214.00. Tullyvallen farmer 444k, £1,015, £229.00; Carryduff farmer 494k, £1,115, £226.00; Carryduff farmer 494k, £1,095, £222.00; Carryduff farmer 492k, £1,075, £219.00; Carryduff farmer 452k, £985, £218.00; Lisburn farmer 448k, £975, £218.00; Fivemiletown farmer 458k, £995, £217.00; Hillsborough farmer 500k, £1,085, £217.00 and Waringstown farmer 478k, £1,035, £217.00. Newtownhamilton farmer 330k, £765, £232.00; Rathfriland farmer 376k, £825, £220.00; Rathfriland farmer 364k, £795, £218.00; Dromara farmer 358k, £765, £214.00; Rathfriland farmer 346k, £735, £212.00; Moira farmer 382k, £805, £211.00; Portadown farmer 382k, £805, £211.00 and Annaclone farmer 380k, £795, £209.00. The 170 bullocks sold in a steady demand with good quality middleweights from £190 to £249 per 100 kilos for a 356k Limousin at £885 from a Dromara farmer followed by £235 per 100 kilos for 390k Limousin at £915 from a Newtownhamilton producer. Heavy bullocks sold steadily from £190 to £218 per 100 kilos for 506k Aberdeen Angus at £1,105 from a Dromore farmer. Top price bullock £1,315 for 628k Limousin £209 from a Tandragee farmer. Good quality Friesian bullocks sold from £145 to £169 per 100 kilos for 614k at £1,035 from a Newry producer. Derrylin farmer 506k, £1,105, £218.00; Newtownhamilton farmer 522k, £1,105, £212.00; Tullyvallen farmer 592k, £1,245, £210.00; Mayobridge farmer 526k, £1,105, £210.00; Mayobridge farmer 518k, £1,085, £209.00; Tandragee farmer 628k, £1,315, £209.00; Newtownhamilton farmer 558k, £1,165, £209.00; Tandragee farmer 566k, £1,175, £208.00 and Tullyvallen farmer 518k, £1,075, £208.00. Dromara farmer 356k, £885, £249.00; Newtownhamilton farmer 390k, £915, £235.00; Newtownhamilton farmer 412k, £945, £229.00; Newtownhamilton farmer 440k, £965, £219.00; Dromara farmer 406k, £885, £218.00; Newtownhamilton farmer 490k, £1,065, £217.00; Mayobridge farmer 440k, £955, £217.00; Lisburn farmer 456k, £975, £214.00 and Dromara farmer 434k, £925, £213.00. 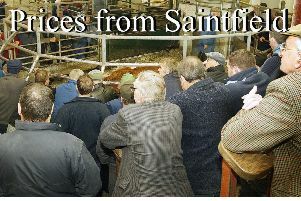 Newry farmer 614k, £1,035, £169.00; Gilford farmer 640k, £1,005, £157.00; Cullyhanna farmer 574k, £875, £153.00; Cullyhanna farmer 540k, £815, £151.00; Middletown farmer 602k, £875, £145.00 and Cullyhanna farmer 586k, £835, £142.00. 150 weanlings sold in an exceptionally strong demand with light males selling to £318 per 100 kilos for 358k Limousin at £1,140 from an Augher farmer followed by £290 per 100 kilos for 326k Charolais at £945 from an Armagh farmer. Main demand for good quality light males from £230 to £280 per 100 kilos. Stronger males sold from £200 to £267 for 404k Limousin £1,080 from an Augher farmer. Heifer weanlings sold to a top of £297 per 100 kilos for 354k Limousin at £1,050 from an Augher farmer. The same owner received £244 per 100 kilos for 350k Limousin at £855. All good quality heifers from £200 to £260 per 100 kilos. Augher farmer 358k, £1,140, £318.00; Collone farmer 326k, £945, £290.00; Augher farmer 366k, £1,040, £284.00; Keady farmr 284k, £760, £268.00; Markethill farmer 236k, £630, £267.00; Keady farmer 284k, £750, £264.00; Armagh farmer 364k, £945, £260.00; Keady farmer 278k, £700, £252.00 and Loughgilly farmer 284k, £710, £250.00. Augher farmer 354k, £1,050, £297.00; Collone farmer 298k, £785, £263.00; Collone farmer 294k, £760, £259.00; Newry farmer 254k, £650, £256.00; Keady farmer 252k, £640, £254.00; Augher farmer 350k, £855, £244.00; Newry farmer 312k, £730, £234.00 and Augher farmer 352k, £810, £230.00. Suckler outfits sold to a top of £1,330 each.